Scenario analysis is the most efficient approach to understanding your needs and determining the right vendor shortlist. 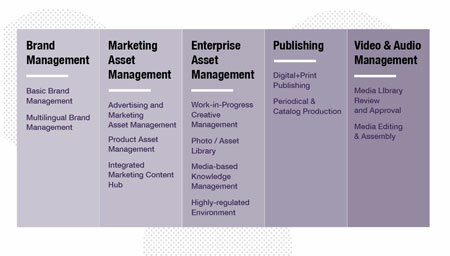 In the newly release and revamped Digital Asset Management (DAM) research, we settled on 13 common scenarios (including some new ones) to evaluate ~30 DAM vendors. While not always by vendor design, DAM products will fit better — or worse — for different use cases. No single product will fit every scenario; in fact, most tools excel at only one or two primary use cases. So RSG's thirteen common DAM scenarios should be the primary discriminator to help you identify which products could be a good fit for you. These scenarios are abstractions and of course will overlap a bit. In practice, your own digital asset management effort will most likely comprise a combination of scenarios and that's why picking the best DAM plaform often entails making some key trade-offs. Over the next few weeks, we'll be publishing a breakdown of each of the thirteen scenarios. In the meantime, you can build your own custom shortlist based on the scenarios that are most important to you by using the RealQuadrant Shortlist Generator as part of your DAM research subscription.